This entry was posted in Home and tagged Denver Nuggets, Evan Fournier, Kenneth Faried, NBA, NBA rookies, NBA Training Camp, Quincy Miller, rookie hazing, rookies by NBA Rookie Class. Bookmark the permalink. Hey!! 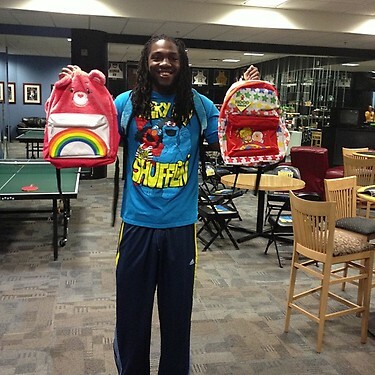 What’s wrong with rocking a Care Bear’s backpack!!?! hahaha I love reading about how team’s veterans haze the rookies!! Lucky for these rookies they didn’t do anything like the Miami Dolphins football team did to their rookies!! hahaha I like how you tied the hazing into to team bonding! Good post! This photo actually made me want to read your post! I think this post about “hazing” is entertaining and different from the normal basketball blog. Good job!